In late 1983, well before Mikhail Gorbachev’s elevation as General Secretary of the Communist Party, the Reagan administration switched gears in dealing with the Soviet Union, moving from a policy of confrontation to the alleviation of the Politburo’s deep anxieties. This was a tumultuous year in superpower relations, marked by the surprise unveiling of SDI, the deployment of “Euro-missiles,” the Soviet walk-out from nuclear negotiations in Geneva, the shoot-down of a Korean airliner that strayed over Soviet territory – a screw up that was characterized as a deliberate, malevolent act by senior Reagan administration officials – and extremely harsh, top-down rhetoric from both capitals. During this perilous year, those with intelligence backgrounds in the Soviet Politburo, led by General Secretary Yuri Andropov, believed that the Reagan administration was willing and capable of carrying out a surprise attack. Andropov & Co. ordered Soviet agents to monitor U.S. blood banks and the number of lights on late at night in the State Department and Pentagon. The U.S. intelligence community, chastened by the “Team B” critique of its too-soft assessments of Soviet strategic goals, had officially come around to the view that the Kremlin was seeking to exploit its emerging strategic superiority. During most of the first three years of the Reagan administration, Washington and Moscow were like ships passing blindly in the night, both convinced that some sort of crash was imminent. Why did the Reagan administration switch gears? Was this the result of a carefully planned presidential script, whereby the Reagan administration’s military build up served as the precursor to negotiated arms reductions? A new book by Martin and Annelise Anderson, Reagan’s Secret War (2009), argues this case: “With the benefit of hindsight, we see intent, planning, and timing.” Paul Lettow’s book, Ronald Reagan and his Quest to Abolish Nuclear Weapons (2005), makes a similar case. Or was this switch the result of a shifting balance of power among Reagan’s advisers, where deal-makers supplanted hard liners? Many first-person accounts of the Reagan years, as well as Strobe Talbott’s fine books, provide ample evidence for this thesis. I believe there is a third explanation for the Reagan administration’s turn-around but, as yet, there is only indirect evidence for this hypothesis. Don Oberdorfer told some of this tale in The Turn (1991). Two months after KAL 007 was shot down, the United States and its NATO allies conducted a “nuclear release exercise” code-named Able Archer. The Andersons tell us that this exercise was carried out with “a bit more enthusiasm than usual.” Suffice it to say that Able Archer gave paranoids in the Politburo added reason to observe the night shift at the Pentagon. David Hoffman’s new book, The Dead Hand: The Untold Story of the Cold War Arms Race and Its Dangerous Legacy (2009), adds further detail to this hair-raising story. 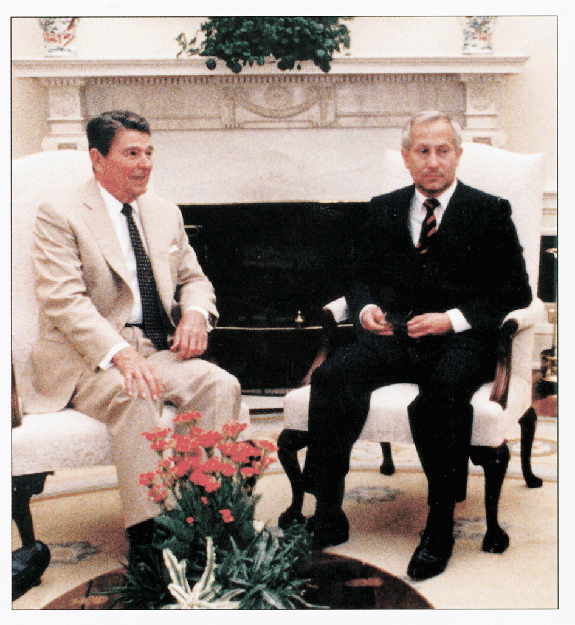 During this time, British intelligence was handling a Soviet double agent, Oleg Gordievsky (pictured above, with Reagan), then stationed in London. “On the night of November 8-9,” Oberdorfer writes, “according to Gordievsky, Moscow sent flash telegrams to its KGB stations in Western Europe to gather all possible information on the highest priority basis of U.S. preparations for a surprise missile attack against the Soviet Union.” This information was passed along to the CIA “within weeks after the end of Able Archer.” Hoffman’s reporting suggests that Gordievsky’s alarming information was conveyed before Able Archer, as well. When did this information reach President Reagan? I feel the Soviets are so defense-minded, so paranoid about being attacked, that without being in any way soft on them, we ought to tell them no one here has any intention of doing anything like that. Reagan then began working more intensively with Secretary of State George Shultz to lay the groundwork for reassuring the Kremlin and re-starting negotiations. The Andersons mention Gordievsky on the page after quoting this diary excerpt, but not as the source of Reagan’s disquiet. My sense is that Gordievsky played a crucial role in the turnaround from confrontation to negotiation by de-clawing the Team B approach to the Kremlin, reaffirming in Reagan’s mind the need to act to avoid Armageddon, and empowering the deal makers around the President. Is Gordievsky one of the unsung heroes of the Cold War? More supportive evidence is needed. I wouldn’t term ‘Gordievsky’ or any single vector of information a ‘Hero’. Policy doesn’t shift based on a single leg, Reagan’s advisors were painted a broad picture that over posturing by the US had freaked out the Soviet command to the point where they started narrowing on preemptive counterforce as the sole means of regime survival. To prevent being painted into this corner the Soviets would have been broadcasting this to us on many easily intercepted avenues. Now consider, if the Soviets had actually settled on the conclusion that a preemptive knockout blow against US atomic arsenal was in the paramount interest of the state; soviet intel abroad, soviet commanders in the field and pretty much 99.9999999% of the soviet nomenklatura would have been left in the dark. It would have been a decision shared only with a few elements of the strategic rocket corp, and boat commanders directly. If anyone should be termed a ‘Hero’, whatever that means, it should probably be the soviet policy makers, americanologist and intel officers who choose to preempt a nuclear miscalculation by conveying their concerns to their US counterparts thru, no doubt, a series of well calculated leaks. Episode 2 of the BBC World Service series MI6 – A Century in the Shadows gives an account of the Gordievsky story. I think the whole thing must be understood as a last-ditch Soviet effort to abort the Euromissiles deployment with leaked information that they were “really scared”. I am not convinced that they were actually scared, since the overt Soviet military reaction to Able Archer was mild. The question is, was Gordievsky a witting or unwitting conduit for this disinformation? He has never actually produced the supposedly “alarming cables from Moscow”, and we have to rely on his word alone regarding Moscow’s grave views of the situation. I believe there was a SNIE issued in 1984 to the effect that the Soviets did not perceive an imminent danger of war, and that Soviet war talk was posturing and propaganda intended to achieve political effects. “The Turn”, in my view, did not result from Reagan realizing he had upset the Soviets, but from the need to set the stage for the 1984 election campaign. Reagan knew he’d be attacked as a warmonger, and needed to extend a hand to the Soviets to defang this criticism. Michael I gotta disagree a little bit with you here. I think that you have a point in relation to the external, international factors, but there were also domestic issues that were important here too. I tend to believe that a big reason for the Reagan admin (let’s ignore Reagan himself. He didn’t know the policies of his own administration) ease up on the rhetoric was the millions who marched for peace in Europe and the US in the early 1980s in response to all that absurd talk about winning nuclear wars etc. History always ignores the little people because history is written to glorify elites; people aren’t allowed to believe that they can actually change things. The admin had to outflank the peace movement hence the shift in rhetoric. If we have to quote Reagan’s damn diary then we might as well cite that part where he mentions that 100 million Americans watched “The Day After.” That was a problem. Secondly, supply-side economics was smashing the economy. So we need to take into account what David Stockman was saying at the time about defense spending and tax cuts (for the rich) and its impact on fiscal policy. As you imply here the change was in tone and rhetoric. The policies continued as before and the major arms control breakthroughs that helped to end the cold war came during the Bush the Elder administration. I like Frances Fitzgerald’s “Way Out There in the Blue”. She makes the point that the Reagan admin was engaged in the process of arms control, but was really stalling (as Kissinger would have called it). Even on INF (the signature Reagan era accord), it took a completely unexpected concession from Gorbachev to achieve it. MarkoB: Why ignore Reagan himself? As “celebrated” as he was, he was (in terms of his actual prowess) a mediocre president at best, yet he was treated as a god by many. Still can’t figure that one out. Ho hum. Who could have guessed this would turn into Reagan bashing. President Reagan is so problematic for arms control wonks because he was the antithesis of a wonk. (One of my favorite Reagan diary excepts was before his first summit meeting with Gorbachev: “Lord, I hope I’m ready & not over-trained.”) Reagan’s simplistic understanding of nuclear-related matters used to drive me nuts. But I came to appreciate how deeply he felt about nuclear weapons, his tenacity, and his unwillingness to settle for marginalia. I worked for a President (Carter) who understood particulars, got enmeshed in them, and would up with very little for all of his exertions. I know, I know, there were many reasons why Reagan accomplished much in this realm while Carter didn’t. It’s far better to have Gorbachev as a negotiating partner than Brezhnev, and it also helps to be dealing with a failing Soviet empire. Those who focus on these factors, as well as on the pivotal roles that George Shultz and Paul Nitze played, while minimizing Reagan’s role, are refighting old battles, in my view. Reagan needed all of the above to succeed, but success absent one of the principal players was inconceivable. I was very interested in the NIEs early in the Reagan years that reflected Team B’s analysis of the emerging Soviet superiority, and the dangerous activities the US might expect as a result. After Able Archer and Gordievsky’s reporting, which strongly suggested that real dangers could result from perceived Soviet weakness rather than strength, the SNIE that Lugo refers to was commissioned. I got to interview key drafters of the SNIE at CIA Headquarters for some research I was doing on the estimaative process. One of the problems I had with the SNIE (which has been declassified) was that the same authors who wrote the NIE also wrote the SNIE — so a mea culpa was not exactly in the cards. But it is true, as Lugo says, that the kind of alert that one might expect if the Kremlin was completely freaked out did not occur. Thank you, Jeffrey, for adding the White House pic of Reagan and Gordievky. Why do you suppose the President of the United States would meet in this way with a Soviet double agent? Late in 1986 Reagan received Gordievsky in the Oval Office and thanked him for what he had done. Putting his arm around Gordievsky’s shoulder, the president promised to try to persuade Gorbachev to allow his family to leave Moscow and join him in Britain. The invitation, I think, is meant to bolster the circumstantial inference. It is not bad, as evidence goes, though short of conclusive. Reagan prodded Gorbachev repeatedly to let people go. He understood that this would be more successful if done privately. So Reagan’s pattern of behavior suggests that, while family reunification might have been part of the reason for his meeting with Gordievsky, it’s not the whole story. I believe Gordievsky’s reports played an important role in Reagan’s thinking. But there were other events as well. Among them: a SIOP briefing (which Reagan took note of in his diary) and the made-for-television movie, “The Day After,” which Reagan had previewed at Camp David in October. The broadcast came Nov. 20, just two days after the Reagan diary entry which Michael cited above. Reagan said he had been “greatly depressed” by the film. He may also have been influenced by the crisis over the KAL shootdown and the Able-Archer ’83 exercise. Further, Gates has noted in his memoir that Casey briefed Reagan Dec. 22 on separate intelligence from the GRU about the depth of paranoia in Moscow. We know from the Katayev documents and separate Politburo minutes that the Soviets were deeply worried about the Pershing II deployments. They feared decapitation. They even talked about trying to find a way to use the Moscow ABM system to intercept the Pershings. I tend to doubt Reagan was aware that some over here had their doubts about Gordievsky. Reagan would probably have dismissed them anyway, since he had a strong relationship with Thatcher, and the Brits were heavily invested emotionally in having finally gotten a “genuine” prize mole after having been penetrated so many times themselves. SEOUL (AFP) – The United States and its ally South Korea have drawn up a contingency plan to cope with emergencies in North Korea, including a possible regime change there, a report said Sunday. “Operational Plan (OPLAN) 5029” was completed by Seoul and Washington recently, Yonhap news agency said, quoting an unnamed Seoul source. —if this is important to you, please use this. The Day After seems to have annoyed the Reagan Administration greatly.